If you are lucky enough to own an iOS-based device, you’re in good company. Last year Apple announced that over 1 billion are currently in use across the world. You’re also lucky, as you have an extremely powerful processor, vividly detailed display screen, and incredibly precise control interface at your disposal. 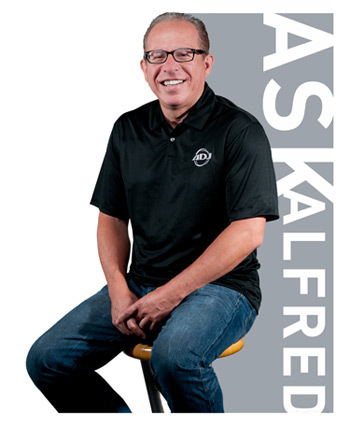 These are all attributes that make for a fantastic lighting controller so, as well as checking your social media feeds, snapping selfies, and keeping on top of your email, why not utilize the power of your iPad or iPhone to control your lightshow? Setting up your iOS device as a lighting controller doesn’t have to be complicated, especially if you make use of ADJ’s new Airstream Wifi Pack. This innovative switch pack allows simple on/off control of eight separate AC outlets which can be used to power lighting fixtures and special effects. Control over switching on and off the power is then provided through an easy to use app, which means that lights and effects can be triggered remotely from anywhere in a room. Although the app is both simple to setup and to use, it also offers a number of extremely powerful features. The eight trigger buttons for the AC outlets can be easily customized with your own text labels and even with photos from your iOS device. This means that you could take a photo of each of the lights on your rig and then assign those photos to the buttons that activate each fixture’s power supply. Pressing the picture of the light would then make that fixture turn on or off! The Airstream Wifi Pack app also offers powerful programming capabilities that allow equipment to be scheduled to turn on or off automatically at different times of the day and even on specific days of the week. This means that the system is also ideal for use as part of permanent installations in leisure venues where different effects are required to automatically turn on and off at designated times. 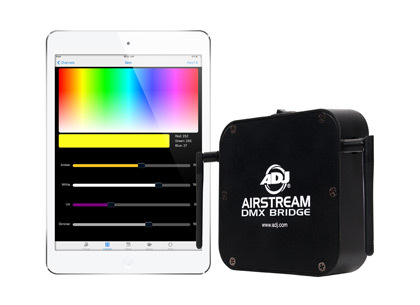 If you want greater control over your lightshow than simply switching effects on and off, the ADJ Airstream DMX Bridge provides an easy to setup and use DMX control solution that can be controlled directly from an iPhone or iPad. Sitting between your iOS device and your lighting fixtures, the Airstream DMX Bridge can connect wirelessly with any WiFLY-compatible DMX lighting units and also features an XLR output socket to allow non-wireless fixtures to be connected via cables. It then also connects wirelessly to your iOS device, allowing your lightshow to be easily programmed and operated directly from a simple to use app. This app allows equipment to be patched from a large database of fixture profiles covering ADJ’s full range of lighting units as well as products from other leading manufacturers. It then allows Scenes to be programmed using on-screen sliders as well as useful programming tools such as a color selection palette. The app also includes a powerful effects generator that can be used to easily create complex moving light patterns with a few swipes of your finger. Once programmed, Scenes can be easily recalled live at an event with a tap of your iOS device’s screen, while multiple Scenes can also be combined together into Shows with custom transition times programmed in. 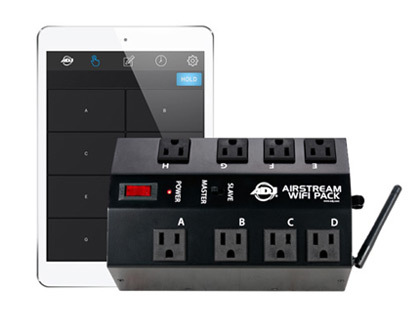 Suitable for different purposes, and providing different types of control over your lighting fixtures, both the ADJ Airstream Wifi Pack and Airstream DMX Bridge offer the opportunity to utilize your iPhone or iPad to control your lighting equipment. So, if you own an iOS device, why not make use of its processing power, high quality graphics, and precise touchscreen to take digital control of your lightshow using one of ADJ’s affordable and easy to setup iOS control solutions? Both iOS lighting control solutions are available from ADJ USA and ADJ Europe. The AIRSTREAM WIFI iOS App is free to download from the App Store. Click here to download. Download the AIRSTREAM DMX App for free from the App Store: Click here to download.